Map at left: The Kansas State Highway System, John W. Gardner, Director, W. V. Buck, State Highway Engineer. 1928. The legend on the map shows this road as "Unimproved (Earth)". On this map it is labeled as "12". The broken line road connecting Wilmore to Sun City was labeled as "Earth (County Road Connections)". Collection of Phyllis Scherich. 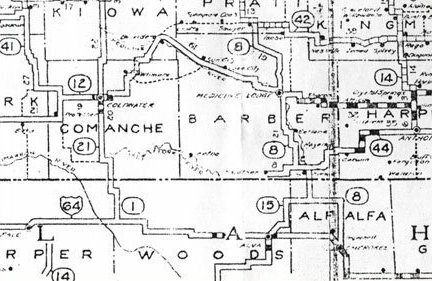 Detail of a 1934 Map of Highway 160. Map at left: 1936 Phillips Petroleum map of Kansas, detail showing Comanche County. Note by Phyllis Scherich, 2004: "This is the first map that had this location labeled "Arrington" that I have seen. The location was the camp of Jesse Evans, then the site of the headquarters of the Comanche Pool from 1878 to 1886. After the Pool was dissolved it remained as the small town of Evansville, named after Jesse Evans, one of the organizers and large owners in the Pool. Later it ceased to exist as a town, but served as headquarters for Mortimor Platt’s Ranch, the Arrington Ranch, then the West Ranch of Davis, Nolan, & Merrill Grain Company. Since the early 50’s it has been the Merrill Ranch headquarters. There are currently three occupied homes at the site, with a population of 8." U.S. Highway 160 has recently been designated as the Gypsum Hills Scenic Byway by the Kansas Department of Transportation and the Federal Highway Administration through the Kansas Scenic Byways Program. 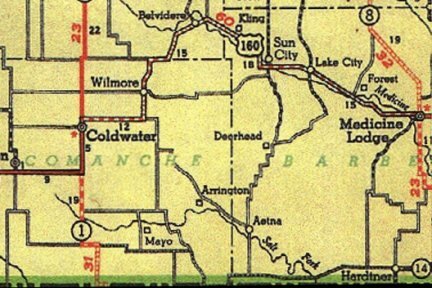 Above:Topographical map of Highway 160 from Coldwater (at left) to Medicine Lodge (at right). Highway 160 between Coldwater and Medicine Lodge, Kansas, looking east. Photo by Phyllis Scherich, 2003. From C. J. Binning Studio, Medicine Lodge. Photo probably taken by Homer Venters of Lake City - see his write-up in Barber County History Book. Negatives supplied by John Nixon of Medicine Lodge to Phyllis Scherich. Thanks to Bobbi Huck for printing these black & white negatives! 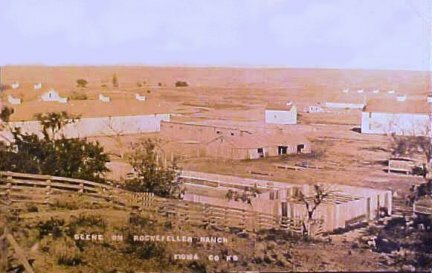 At left: The Rockefeller Ranch near Belvidere, Kiowa County, Kansas, along the old route of Highway 160. Image from a postcard circa 1910. 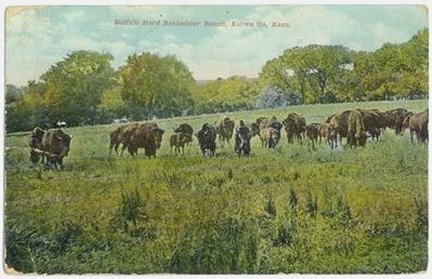 At left:The Rockefeller Ranch near Belvidere, Kiowa County, Kansas, along the route of old Highway 160, from an old postcard. "It's been approximately 14 years now since the state highway commission promised the federal designating board that if they gave old K-12 the designation of US 160 the road would be straightened out. More than a decade has passed and the road is not finished." - Barber County Index editorial, January 11, 1940. "My grandfather, John A. Lyons took this photo in 1925 on a family trip by car to visit relatives in Protection, Comanche County, Kansas." -- Connie Chancellor. 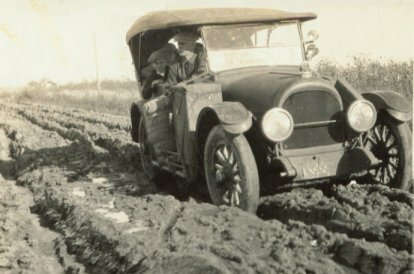 Though the location where this photo was taken is unknown, the road conditions are similar to those of old US 160 during wet times of the year. The last remaining portion of the old Mule Creek Bridge on Highway 160, 27 April 2004. 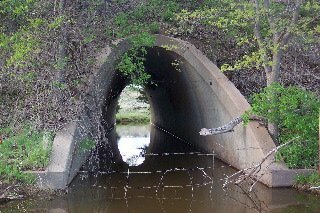 A ellipse culvert under Highway 160 in 2004. Highway 160 has this one, called the Little Ellipse, and another called the Big Ellipse. 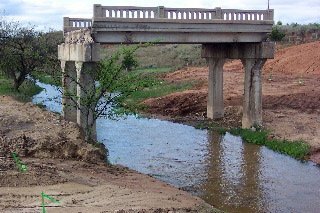 There are only a few culverts of this type in Kansas. You can tell from the picture that it was "formed" in place. "During the C.C.C. highway project to build Highway 160 from Coldwater to Medicine Lodge, Kansas, Dad (Ernest L. Ferrin) worked on the Mule Creek bridge in the winter of 1935/36. He drove a team of horses and feed wagon back and forth to work. He left home about 3:30 a.m. and returned about 10:30 p.m. He loaded the wagon with feed on the way home and fed the cattle the next morning on the way to work. I believe he got $3.00 a day for his team and himself". -- Wendel G. Ferrin, from Wendel Gene Ferrin: Life Stories, privately published. 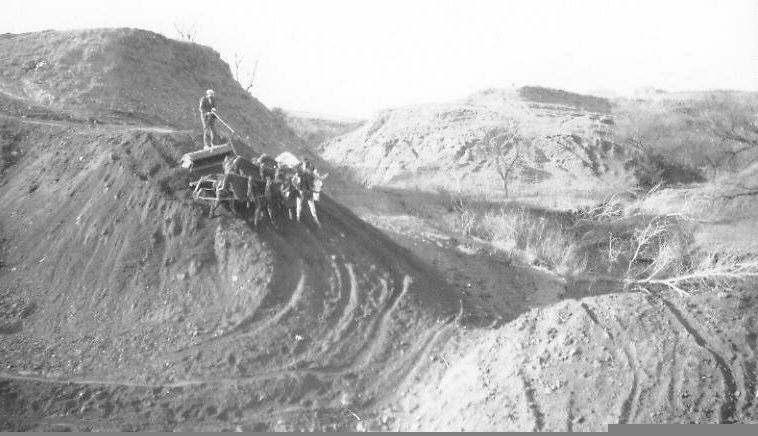 Mineral Resources of Comanche County, The Western Star, February 18, 1938: "At least two deposits of volcanic ash occur in Comanche county. One of these is about 1 mile north of Wilmore and the other about 5 miles south of the same town. A small amount of material has been removed from these deposits and used in the construction of U. S. Highway 160." This RootsWeb website is being created by Jerry Ferrin with the able assistance of many Contributors. Your comments, suggestions and contributions of historical information and photographs to this site are welcome. Please sign the Guest Book. This page was last updated 06 July 2008. The following RootsWeb Visitors Counter began counting on 27 December 2003.